Earlier this month, I had the opportunity to attend the PBS Annual Meeting in Austin, Texas. As a PBS KIDS Ambassador, I frequently get a chance to be the first one to share news and other resources (like free downloads) with you about upcoming shows, new episodes, and exciting content across PBS KIDS' multiple digital platforms. As a true Tejana who lives very far from home, I can't tell you how much fun I had in Austin. Even though I was only there a day and a half, it was such a joy to be in a city where everywhere I looked, I could see the influence of my Texas and Latino culture blended together. I mean, really, as soon as I walked off the plane into the airport, I knew that I was in my home state; delicious aromas greeted my nose, I passed a beautiful display of Texas-themed quilts, and Latino art and imagery were everywhere! Okay, so let me focus now on all the great things I learned at the meeting. The next morning, I was up bright and early to have breakfast and learn that this coming year, PBS KIDS is turning its attention to science with two new programs that your kids will love. First, let me tell you about Nature Cat, a super fun new series created by brothers Adam and David Rudman. David is probably best known for being the puppeteer behind Sesame Street's Cookie Monster and Baby Bear. David and Adam have worked together before. Do any of you remember the show Jack's Big Music Show that used to air on Noggin? Yep! They created it. This time, they were inspired by their own childhoods of time spent outdoors. (Remember how much time you used to spend in your backyard or front yard when you were a kid? 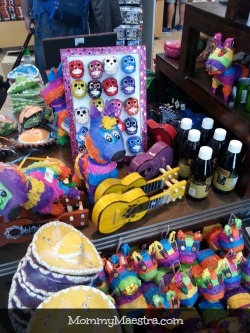 I was ALWAYS in my 'Buelita's garden.) They wanted to create a show that encouraged children to get kids outside and away from the couch and their digital devices. 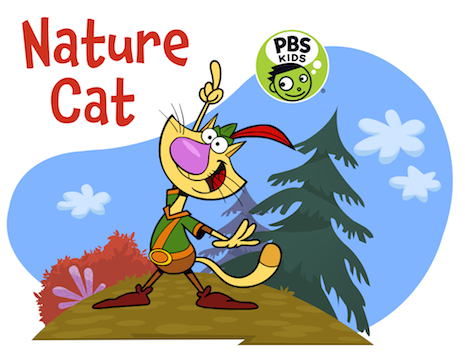 In comes Nature Cat to the rescue. This animated show is designed to encourage kids to explore and develop connections with the natural world. Fred is our hero. He's your everyday house cat who dreams of going on outdoor adventures. His friends are always at his side to share his deep love of Mother Nature. This series motivates kids to observe, ask questions and investigate the natural world in their neighborhood and beyond. It also empowers kids to be responsible stewards of the environment and to delve into conservation. For example, your child might learn how to build a butterfly garden, make bird feeders, or use the Nature Cat Scavenger Hunt app (to be released this November!) to find animal tracks outside. David and Adam grew up loving Looney Tunes (as did I!) and their love of that series influenced the look and feel of this show. You can see that reflected in the animation style of the show. But I'll tell you the absolute best part of this show is that most of the voices behind the characters are done by cast members of Saturday Night Live! The next big series coming out is Ready, Jet, Go! I absolutely love this series that explores space and teaches your child astronomy concepts through the adventures of Jet Propulsion, an alien from outer space who visits Earth. 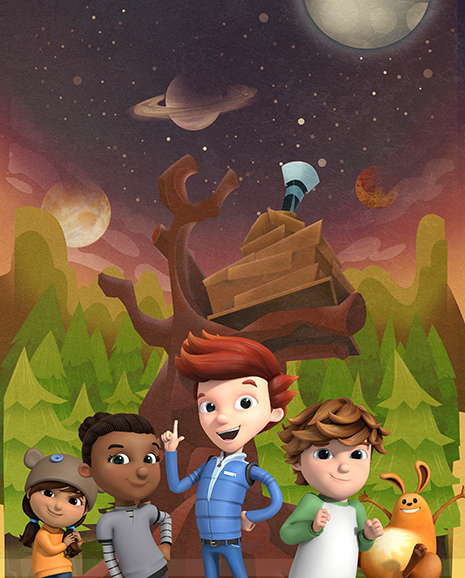 Together with the neighborhood kids, Jet travels the galaxy in search of answers and adventure. The creator of the series Craig Bartlett is also the mastermind behind Dinosaur Train, and like that prehistoric show, Ready, Jet, Go! will also have a live scientist who teaches kids fascinating facts and concepts in between the animated segments. Dr. Amy Mainzer is an astronomer at Jet Propulsion Laboratory, a research and development center and NASA field center located in La Cañada, Califonia. In her short video segments, she introduces kids to experts in the field of astronomy, basic physics, how things work, careers in science, and the history of our U.S. space program. Your kids will learn about the first astronauts in space, what their rocket looked like, as well as crazy cool science experiments such as how to build a comet in your kitchen! Overall, I think parents and children both are going to love the new programs lined up for this coming year. Stay tuned to MommyMaestra for updates on these and your other favorite PBS KIDS shows! Disclosure: I'm a PBS KIDS ambassador. I attended the PBS Annual Meeting to learn about these great new shows for our kids. All thoughts and opinions above are strictly my own.